Supplied by American Tactical, Inc.
Never runs out of air! Difficult to fill from a tank. The American Tactical Nova Freedom stands alone in the market as an affordable, multi-shot PCP air rifle with a built-in hand pump. It's hard-hitting and accurate with mid-weight and above lead pellets. If you're hunting, set the gun to High Power and be prepared to pump every 5 or 6 shots. For target shooting, Low Power still gives plenty of FPS and an amazing 20 good shots between pumping. If you like this concept, there's nothing else to touch it in the market at anywhere near the price. 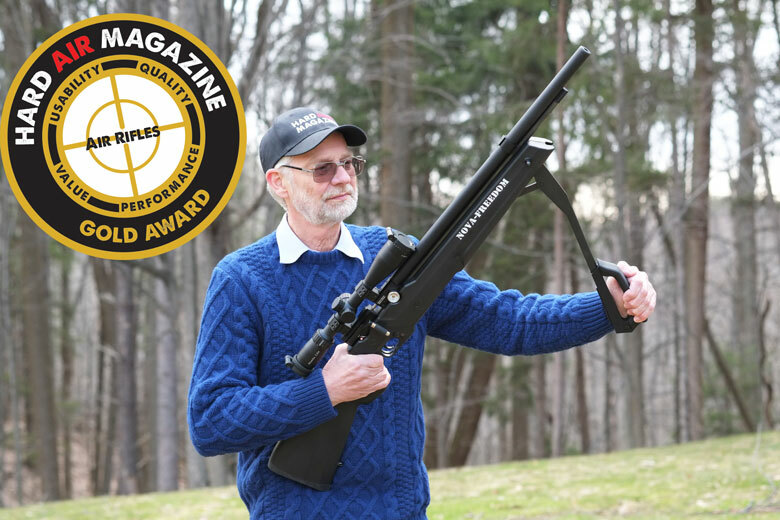 The American Tactical Nova Freedom easily earns a coveted HAM Gold Award for what it does and the way it does it! Firstly, let’s be clear. 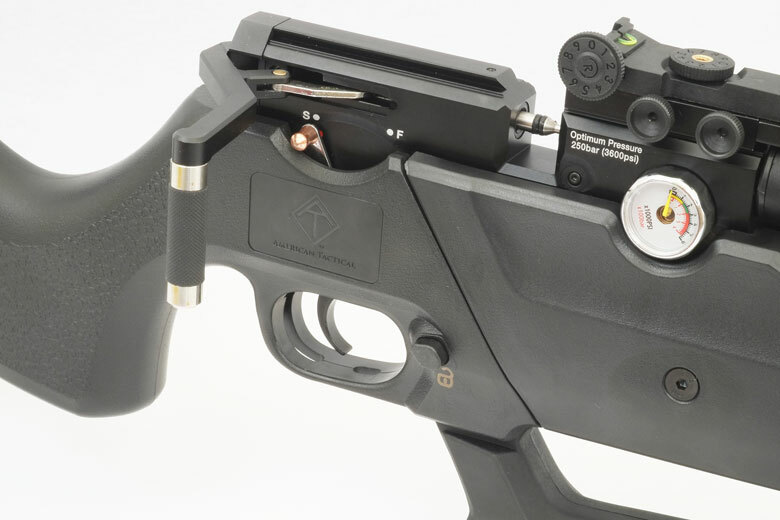 The American Tactical Nova Freedom is a very unusual air rifle. It’s a PCP with a built-in hand pump. Yes, there have been a few other airguns of a similar configuration in the market – the FX Independence springs to mind immediately. But there’s certainly nothing remotely comparable in the $380 price range. The built-in hand pump definitely works. 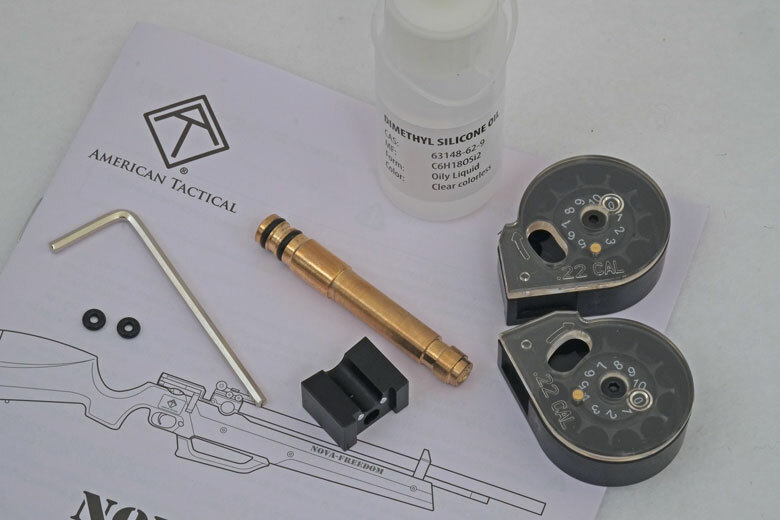 It means that owners of the American Tactical Nova Freedom can do without the cost and inconvenience of a separate High Pressure Air hand pump. (It can also be filled from an external tank or HPA hand pump if required, however). It also – and perhaps more importantly – means that the user is able to re-fill the gun while in the field. This overcomes the inevitable air anxiety (“Do I have enough air?”) that every PCP owner has experienced at one time or another. The downside is an increase in bulk and weight. Hey, nothing’s for free, right? The American Tactical Nova Freedom also has a ton of useful features, as we’ll explore through this review. And it’s very similar to the prototype we saw at the 2017 IWA OutdoorClassics show a year ago. This independence from a separate air supply means that the American Tactical Nova Freedom could well be the PCP that many break barrel owners have been waiting for. It’s powerful, it works and it’s great value! Value For Money There's no competition! Best For Anyone who wants a PCP but fears running out of air. Street Price at Time of Test $380+ scope. Firstly, we should say that – as usual – all the test results were achieved at the High Power setting of the American Tactical Nova Freedom. Many manufacturers provide a choice of power settings on PCPs. But does anyone actually use the low power settings? We’ll find a great reason to do so with the American Tactical Nova Freedom when we review shot count in the “Consistency” section of this review. On High Power, the American Tactical Nova Freedom tested by HAM achieved a maximum Muzzle Velocity of 1,095 FPS with lightweight Gamo Raptor Platinum alloy pellets. 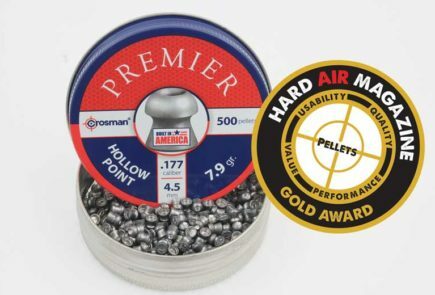 It also exceeded 1,000 FPS with the lightest lead pellets – RWS Hobbys. These are high figures for a .22 caliber air rifle and indicate strong performance, ideal for hunting. As is often the case, accuracy was poor with the lightest, fastest pellets. But once you move to lead pellets of 14.3 Grains weight and heavier, accuracy becomes excellent. 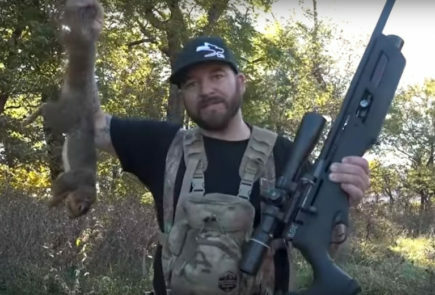 Muzzle Energy – a much more important figure for hunters than FPS – peaks at an average of 31.91 Ft/Lbs over a 10-shot string with the heavy H&N Baracuda Match pellets. This is a very good performance and ideal for hunting. However, there is a slight tendency to vertical stringing in several of the targets. This occurred towards the end of the string as the pressure in the small internal HPA reservoir fell. This drop in FPS – the Extreme Spread – averaged around 53.8 FPS across the 10-shot string for the four heaviest lead pellets. We’ll talk about the reasons for this in the “Consistency” section of this review. Gamo Raptor Platinum 9.7 Grain 1095.24 FPS 25.84 Ft/Lbs Poor. H&N Field Target Trophy Green 10.03 Grain 1074.72 FPS 25.73 Ft/Lbs Poor. 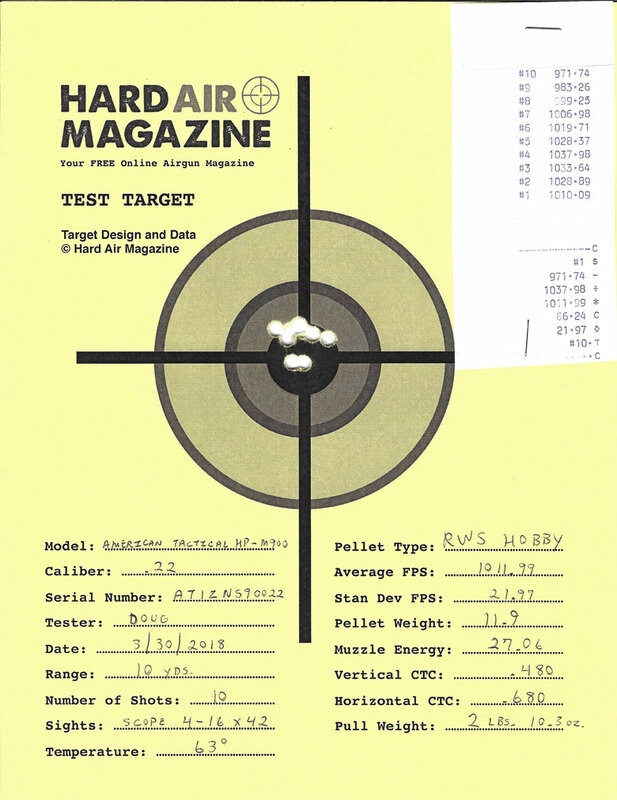 RWS Hobby 11.9 Grain 1011,99 FPS 27.06 Ft/Lbs Poor. Crosman Premier HP 14.3 Grain 959.29 FPS 29.22 Ft/Lbs Excellent. JSB Jumbo Exact 14.35 Grain 965.47 FPS 29.70 Ft/Lbs Excellent. H&N Field Target Trophy 14.66 Grain 954.62 FPS 29.67 Ft/Lbs Excellent. 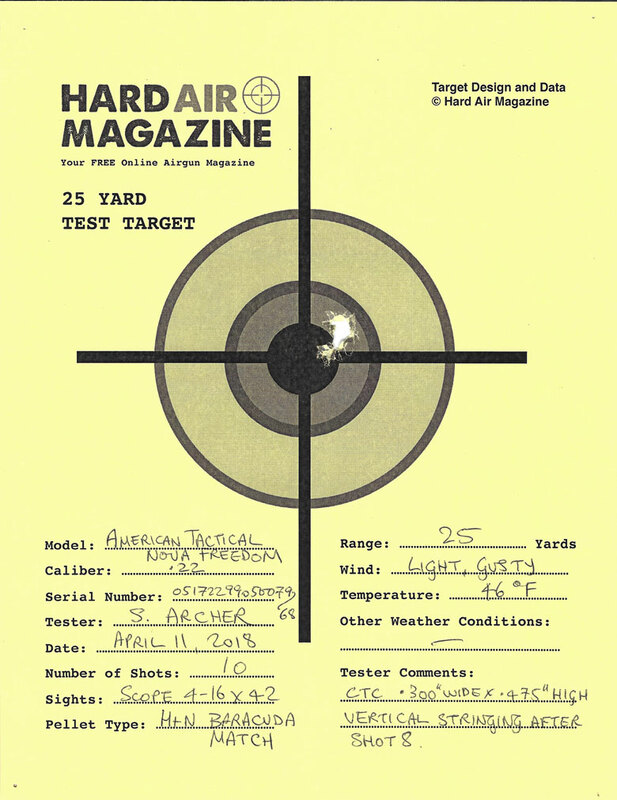 H&N Baracuda Match 21.14 Grain 824.46 FPS 31.91 Ft/Lbs Excellent. Best Tested. It’s a surprise to find that the American Tactical Nova Freedom has a side lever action. Such a cocking system is almost always smoother than a bolt action, but it’s typically associated with more expensive air rifles. This is the lowest-cost PCP the HAM Team is aware of with a side lever. The action of the side lever itself is reasonably smooth, if a little heavier than is often found. However, it’s easy to operate and benefits from having a rubber grip that prevents the operator’s fingers from sliding off in use. There’s a clear, easy-to-use safety below the cocking lever. This is well-placed for right-handed shooters (at least) and functions effectively. The knob at the end of the safety lever is shaped like a gold diablo pellet – an interesting touch of whimsy in the design! The trigger itself has a comfortably-contoured metal blade. As always, HAM shot the gun with the trigger “as received”. The American Tactical Nova Freedom we tested had a reasonably-stout trigger pull weight that averaged 2 Lbs 10 Oz. Although rather too heavy for target work, this is fine for hunting use, which is how the Nova Freedom will probably be used by many owners. The trigger is a two-stage design, but the first stage was almost undetectable, feeling more like a little slack on a single-stage trigger. However, the trigger release was quite predictable and consistent. Overall, the trigger will probably be acceptable for most users. 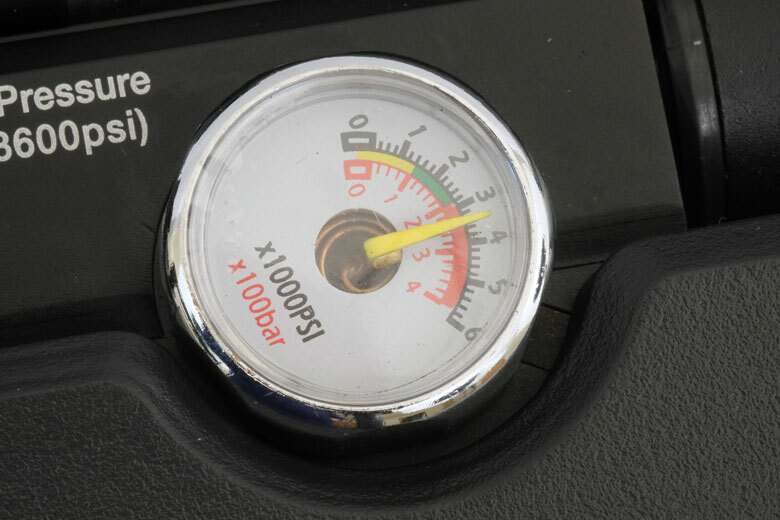 Adjustments for sear engagement, pull weight and pull length are all available for the knowledgeable user. These are accessed from the outside of the gun using an Allen wrench. 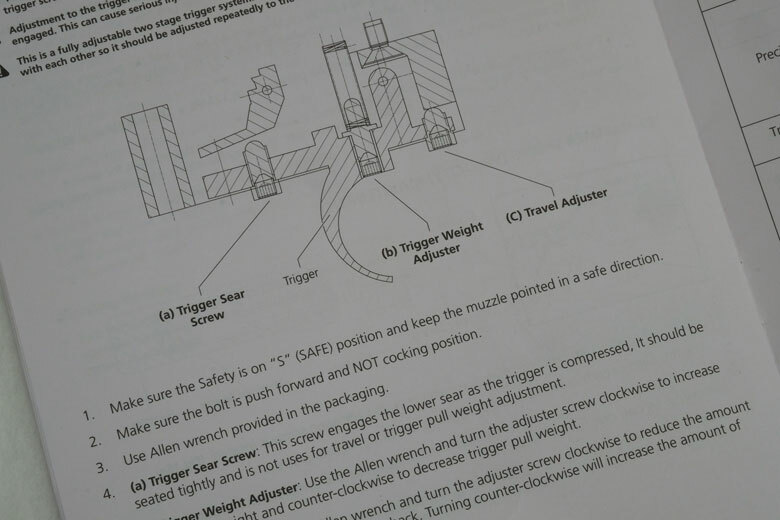 The instruction manual supplied with the American Tactical Nova Freedom gives clear instructions for making trigger adjustments, should the owner feel competent to do so. The manufacturer claims that the American Tactical Nova Freedom will achieve a Muzzle Velocity of 900 FPS in .22 caliber. The sample tested by HAM significantly exceeded that claim with all except one of the pellets in our standard test suite. A maximum of 700 FPS is claimed for the Low Power setting. This was also comfortably exceeded. The manufacturer’s website makes two – somewhat contradictory – claims about the number of shots that can be fired by the American Tactical Nova Freedom without pumping. In one place it says “up to 17 shots”. In another it says “up to 17 shots at over 900 FPS”. In HAM testing, the “up to 17 shots” claim was significantly exceeded, but only in Low Power mode. 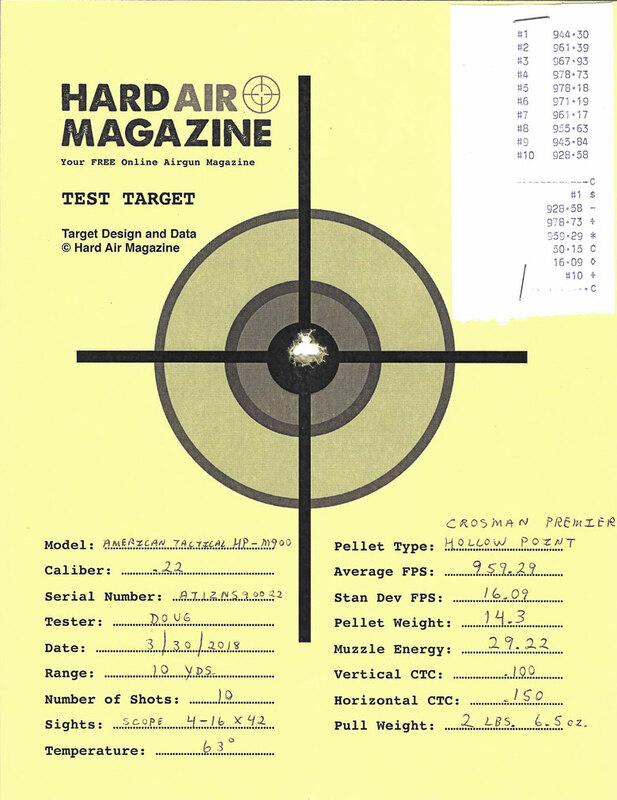 The American Tactical Nova Freedom tested by HAM showed a claimable 24 shots in Low Power mode at well over 700 FPS. But in High Power mode, necessary to attain or exceed the 900 FPS, the maximum number of “good” shots was actually 12. The American Tactical Nova Freedom tested by HAM was very consistent in its behavior. Trigger pull weight was extremely consistent, varying by no more than a couple of ounces either side of the 2 Lbs 10 Oz average. Accuracy was also consistent. Poor with light pellets and excellent with heavier ones. This, of course, is a very common situation with powerful PCP air rifles. Standard Deviation – the measurement of shot-to-shot variation of FPS in a string – was also consistent at about 20 FPS across 10 shots. Now 20 FPS is a high (poor) figure for a PCP air rifle. However it is predictable. It’s also an understandable function of the design of the American Tactical Nova Freedom and the way Hard Air Magazine has tested it. 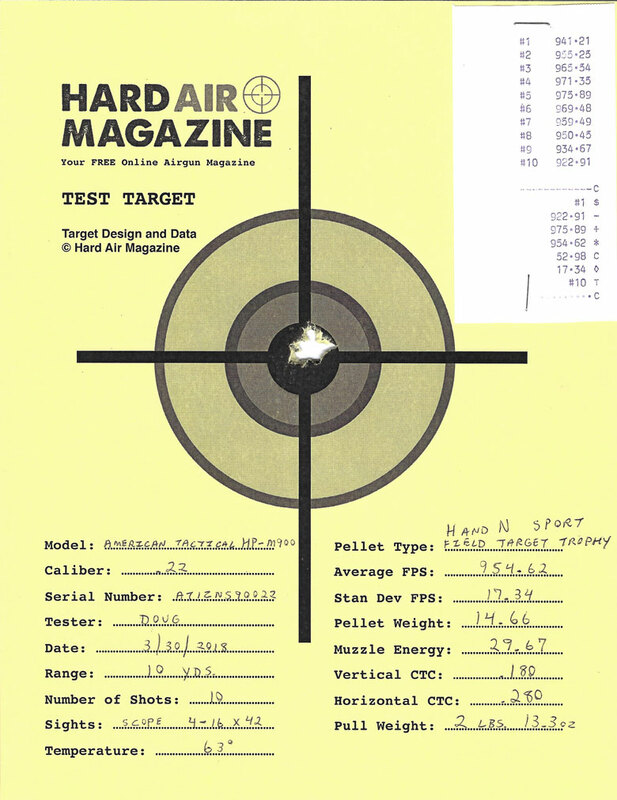 The HAM standard test protocol for PCPs is to fire 10 shots on the High Power setting (if available) without re-filling with air. Of course, this is no problem for most conventional PCP air rifles. However 10 shots is close to the air capacity limit for the American Tactical Nova Freedom on High Power. This can be seen in the chart below, showing performance with JSB 14.35 Grain pellets at the High Power setting. The HAM Team chose to test the American Tactical Nova Freedom according to our standard test protocol for PCPs: taking 10-shot strings from one fill on High Power. This enabled the results of this review to be comparable with all the PCPs we have tested. However, it’s clear from the chart above that the Nova Freedom would have given greater consistency in both Muzzle Velocity and accuracy had we topped-up pressure using the hand pump after 5 or 6 shots. Or, alternatively, if we had used the Low Power setting. So, if you want maximum shot-to-shot consistency from your American Tactical Nova Freedom, HAM suggests topping-up with the built-in pump after every 5 shots on High Power in .22 caliber. If you can be a little more flexible on shot placement, pumping after 10 shots may well be OK.
That, of course, would match the magazine capacity. So pumping every time you change magazines is a simple, logical way to go on High Power. But just look at the shot curve on Low Power!!! On Low Power, we would pump after every 20 shots – two magazines – for simplicity and to achieve a better Extreme Spread of FPS. The American Tactical Nova Freedom is fully shrouded. This makes it tolerably quiet. Subjectively, the HAM Team finds it to be rather louder than the Benjamin Marauder – our gold standard for sound levels. But it’s not very loud and most should find it to be backyard-friendly. The major audible issue is the loud ping made when the American Tactical Nova Freedom is fired. If you thought that the Marauder ping was loud, you’ve heard nothing yet! Here’s a definite opportunity for a de-pinger. Somewhat unusually, the American Tactical Nova Freedom is supplied with open fiber optic sights. The rear sight is adjustable for elevation and windage. 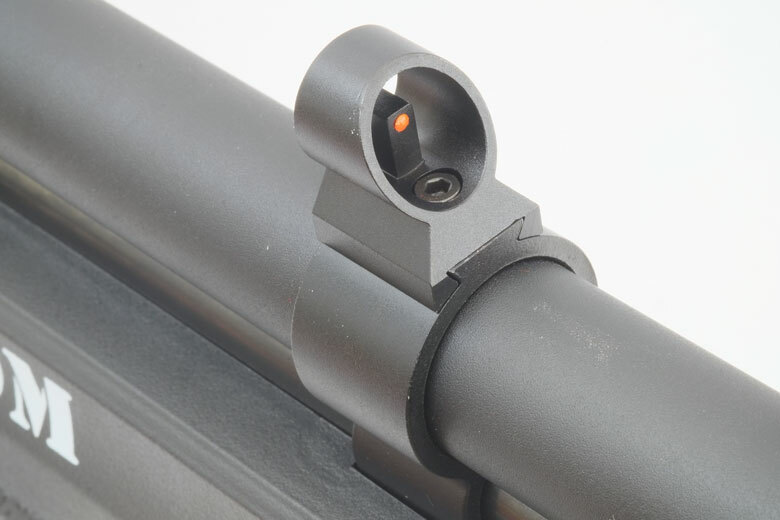 It clamps to the forward part of the scope rail. The front sight is well hooded. Again this has a dovetail fitment, being clamped in place with a setscrew – it’s easy to remove if required with a 2.5mm Allen (hex) wrench. Of course, most users will choose to mount a scope. 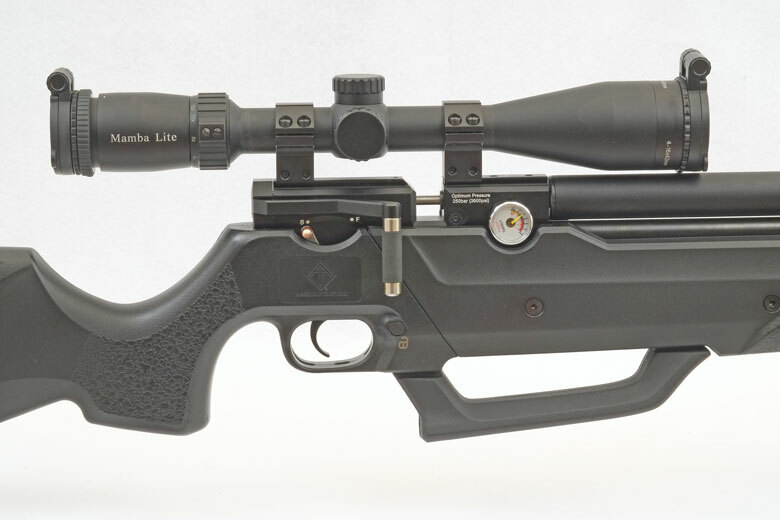 The American Tactical Nova Freedom has the expected airgun dovetail rails in the breech that provide the expected flexibility in scope ring placement. For the test, we mounted a MTC Mamba Lite 4-16 x 42 scope. It fitted the gun well, giving an all-up weight of 9 Lbs 8 Oz. Before starting this review, the HAM Team expected the American Tactical Nova Freedom to be rather “clunky” and unsatisfactory to shoot – entirely because of the built-in pump. But that’s actually not the case. In fact, HAM Publisher Stephen Archer found it comfortable and very stable to shoot the American Tactical Nova Freedom offhand by holding on to the pump handle and bracing his upper arm against his chest, as shown in the photograph below. 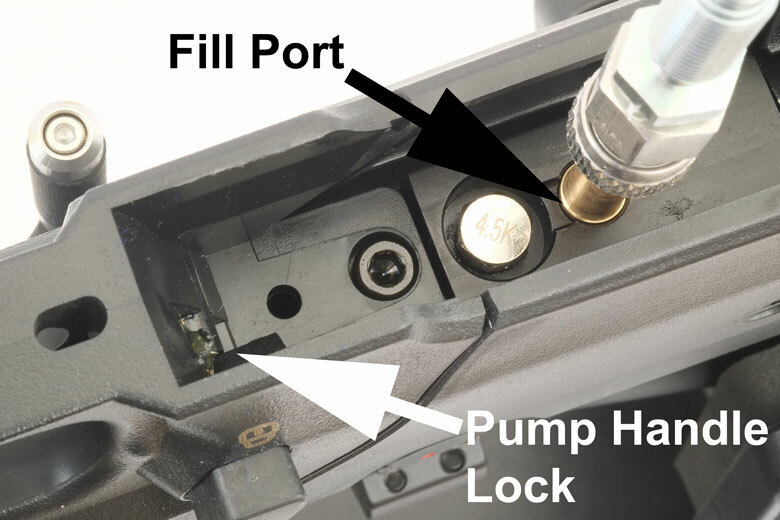 The pump handle can be locked closed to avoid inadvertent operation in this kind of of use. This meant that the pump actually did not cause us an issue in handling and shooting the gun. 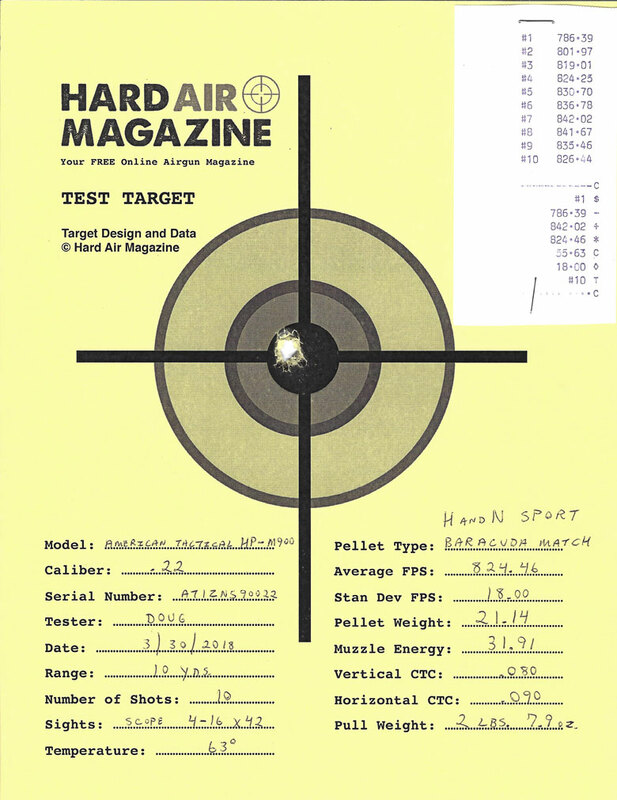 “Easy to shoot” was the comment in HAM Tester Doug Roger’s review notes. The 10-shot magazine is very similar to that found on the Benjamin Marauder and Umarex Gauntlet. It works well, is easy to load and blocks firing when after all pellets are fired. The provision of sling swivel studs is a feature that will be welcomed by many hunters who need to carry their American Tactical Nova Freedom some distance before shooting. Note that – in addition to the High/Low Power power adjustment knob, there’s also a hammer spring adjustment screw in the rear of the breech. The instruction manual references this as a service maintenance feature. However, there’s a good chance that it could provide a means of fine-tuning the FPS, based on some careful trials with a chronograph. There’s no way around it. The built-in pump makes the American Tactical Nova Freedom look somewhat tubby. This is never going to be a beautiful air rifle – at least in the HAM Team’s opinion. And the less-than-subtle NOVA-FREEDOM legend printed on the stock doesn’t help either. So this is definitely a case to bring out the old saying “handsome is as handsome does”! The stock’s plastic molding is fair for the price range. There’s some visible seams that tend to spoil the effect. The American Tactical Nova Freedom is a new air rifle into the market and, right now, it’s not easy to find except from American Tactical themselves. HAM expects that this will change rapidly, however. The Nova Freedom is supplied with two magazines of the appropriate caliber, a single shot tray, a fill probe and the other items shown in the photograph below. The instruction manual is clearly-written and illustrated. It’s in English only. 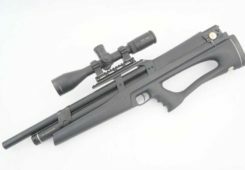 One area where the American Tactical Nova Freedom falls behind the big name airgun manufacturers is in the warranty period provided. 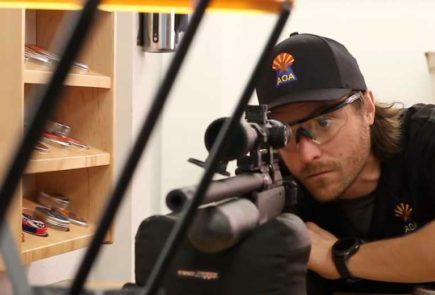 This is one year, at a time when Crosman, Gamo, SIG SAUER and Umarex are moving to 3- or 5-year warranties on air rifles. Warranty is provided in the USA by American Tactical and full details are provided on the back page of the instruction manual. There’s a couple of issues that the owner needs to be aware of with charging the American Tactical Nova Freedom, however. One is that access to the probe filling port is somewhat difficult. It’s just ahead of the trigger, underneath the rest position for the pump handle, recessed in a slot inside the stock. There’s a rubber plug that fills this port when not in use, but this is certain to become lost pretty fast by most owners, we think. And the pressure gauge is incorrectly marked. It shows the red “danger” section as starting at 3,000 PSI when the actual specified fill pressure is 3,600 PSI. If you’re relying on this gauge when pumping, make sure that you read the graduations carefully, not just the colored arcs. 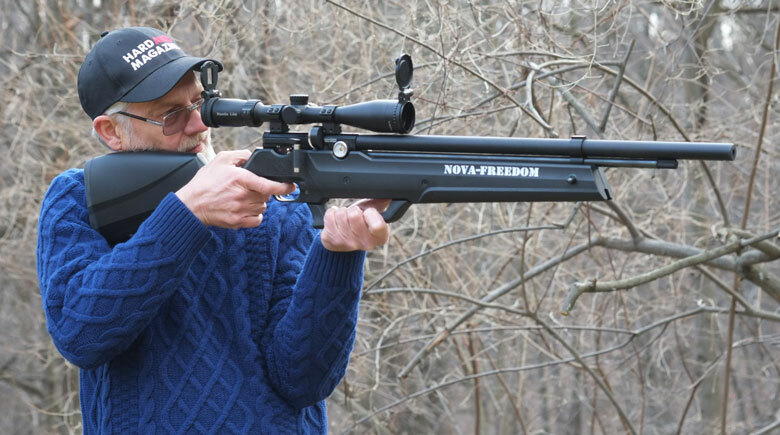 The designers of the American Tactical Nova Freedom are obviously aware of the tendency for pump air rifles to be over-pumped in search of extra power. So they have built a pressure release valve (burst disk?) into the gun to prevent the worst destructive effects should the gun be over-pumped. Good move! The manufacturers claim that the Nova Freedom takes 40 – 60 pumps to fill to 3,600 PSI. Our gun needed 56 pumps to fill from empty. Yes, this is quite an effort, but no more than filling from a separate hand pump. And if you “top up” pressure with the pump when shooting, instead of letting pressure fall to zero, it becomes a much more manageable proposition. There’s also a degassing (depressurization) capability that’s accessed next to the fill port by using an Allen wrench. 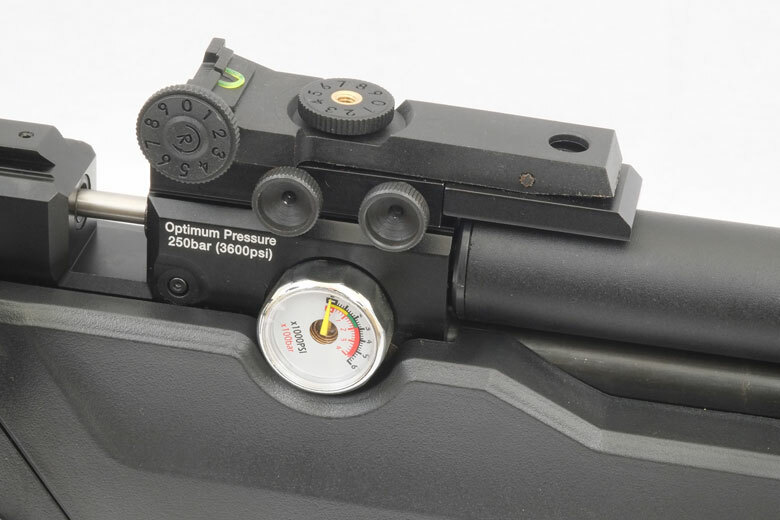 HAM feels that a degassing capability is a desirable safety feature on any PCP air rifle. 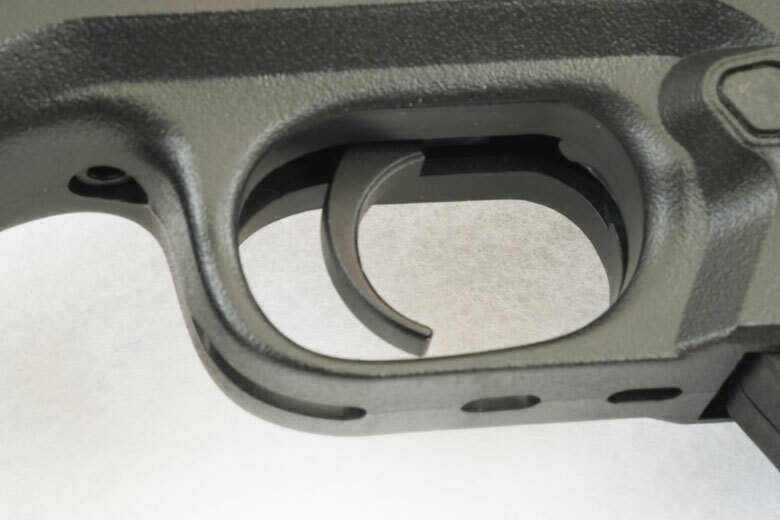 It allows the gun to be made safe in case of an emergency, such as a jammed pellet, or for any other situation where it’s necessary to be 100% sure that there’s no air in the gun.